2018 Jeep Wrangler Review | Specs & Features | Gillette WY " "
What’s the Price for the 2018 Jeep Wrangler? How Many MPG Does the 2018 Jeep Wrangler Get? 2018 marks the debut model year for the JK, the fourth production cycle of Fiat Chrysler’s off-road-primed compact SUV: the Jeep Wrangler. As in years past, this vehicle is available in a vast array of versions; you can get one with two doors (2-door) or four doors (4-door), with 10 trims in total to choose from. The engine that powers this redesigned off-roader still remains the 3.6-liter Pentastar V6, which offers 285 horsepower. However, the engine has been refreshed—it comes with mild electric power assist technology—to produce up to 17 mpg in the city and 21 mpg on the highway (provided that you go with the 2-door). A 6-speed manual transmission (Aisin AL6) is standard, with the option of swapping it with a more convenient 8-speed automatic transmission (850RE Torqueflite). The drivetrain is Command-Trac®, a part-time four-wheel-drive system that provides a 2.72-to-1 low range for rock crawling and neutral for flat towing. With its powertrain configuration, the 2018 Wrangler can tow up to 2,000 lbs. with the 2-door and 3,500 lbs. with the 4-door. The soft top and fold-flat windshield on the Wrangler are now easier to fold flat or away, and the interior looks more modern than ever. You can expect to seat up to four people in the 2-door and five in the 4-door. 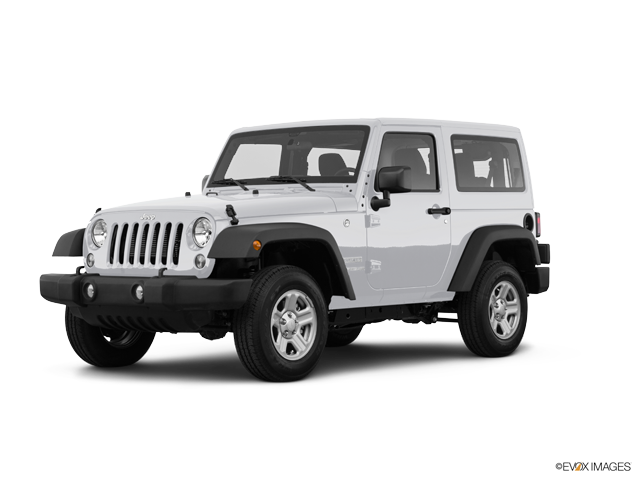 For substantially more room, there’s the Wrangler Unlimited to go with; it offers almost 32 cubic feet of cargo space that can be extended up to 72 cubic feet with the rear seats down. (On regular Wrangler trims, standard and maximum cargo space are measured at a little under 13 cubic feet and 47 cubic feet, respectively.) For infotainment, the 2018 Jeep Wrangler, at the very least, comes with eight-speaker audio, Bluetooth® wireless technology for hands-free phone calling and audio streaming, a USB port and an auxiliary audio jack for connecting mobile devices, and the Uconnect system with a 5-inch touchscreen. Upper-level trims are more likely to have additions or enhancements such as automatic climate control, a nine-speaker Alpine® Premium audio system, trial subscriptions to services such as SiriusXM® Satellite Radio and SiriusXM® Travel Link, a charging-only USB port, a Wi-Fi hotspot, a navigation system, and a Uconnect infotainment system upgraded with a 7- or 8.4-inch touchscreen and Apple CarPlay™ and Android Auto™ for smartphone-based control. For safety, the 2018 Wrangler has advanced multistage front airbags, electronic roll mitigation and stability control, hill start assist, traction control, speed control, and the Sentry Key® theft-deterrent system. Other safety and security features—such as remote keyless entry, security alarm, and an electronic vehicle tracking system—are added or made optional on upper-level trims. Ready for a brand-new adventure in the 2018 Jeep Wrangler? Come check out what we have at our dealership in Gillette, Wyoming. One of our experienced and well-trained sales professionals will be more than willing and able to assist you with finding the Wrangler with your preferred features and options.